Every moment of every Wisconsin Badgers game can be exciting from what’s happening on the field to the fans sitting around you. However, when the sound system at Camp Randall Stadium blares House of Pain’s “Jump Around” between the third and fourth quarters be prepared for the best college stadium tradition in football. When this song is played, fans go crazy, the stadium shakes and fans do what the song says, JUMP AROUND! The home of the Badgers is located of the west side of the University of Wisconsin campus and is the oldest stadium in the Big Ten Conference. Football at the university dates back to 1889 and at the location of Camp Randall Stadium since 1913 when the original wooden stadium was built. For two seasons, football was played here before it collapsed. A new modern, safer steel and concrete structure was needed and a 10,000 stadium was built. The Badgers played their first game at the new stadium on November 3, 1917 against Minnesota. 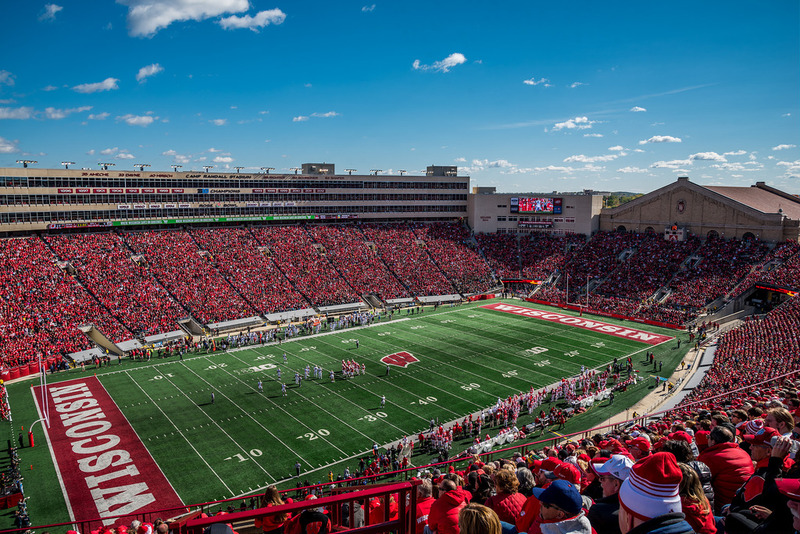 Unlike many other football stadiums in college football, Camp Randall Stadium is not named after the team or someone associated with the university. Camp Randall was an army base during the American Civil War and the Badgers stadium was built on its location. Like many other stadiums, Camp Randall has been expanded many times throughout its history. By 1951 the seating capacity was at 51,000 and in 1958, the track around the playing field was removed and lowered, bringing fans closer to the action. A three level press box and second deck on the west side was completed by the 1966 season increasing the capacity to 77,745. Since 1966, there have been few changes to the stadium. In the early 1990s, Astroturf was installed replacing the grass field and a new scoreboard was added in 1992. Prior to the start of the 2005 season, Camp Randall Stadium was expanded, adding nearly 1,000 club seats, 72 luxury suites, rebuilding the south end zone and enclosing the southeast and west corners with new seats. The Astroturf playing field was removed and replaced by Fieldturf. Today after these expansions Camp Randall Stadium has a seating capacity of approximately 80,321. “Jump Around” may be popular between the third and fourth quarters, but after the game many fans stay for “The Fifth Quarter.” After the end of each game the marching band performs a number of popular songs including “On Wisconsin,” “Space Badgers,” “Varsity,” and a number of others. This tradition is one that many fans stay for after each game.